Abenomics, so called because it is the brainchild of the Japanese Prime Minister, Mr. Shinzo Abe, requires a lower Yen. The policies call for increased taxes as well as a rise in consumer inflation, all of which should tend to decrease the value of the Japanese currency. It might have seemed that the only thing holding back a rise in the USDJPY pair (a rise in this pair means a stronger US dollar and / or a weaker Japanese Yen) would have been the uncertainty surrounding the outcome of the US Non Farm Payrolls report last Friday. In the event it turns out, as noted previously, that the Yen is far more sensitive to the behaviour of the Nikkei Average of Japanese shares than it is to almost any other driver of its value. When the Nikkei falls, Japanese investors rush for the safety of the Yen, driving down the USDJPY pair in the process. And that is what happened yesterday. 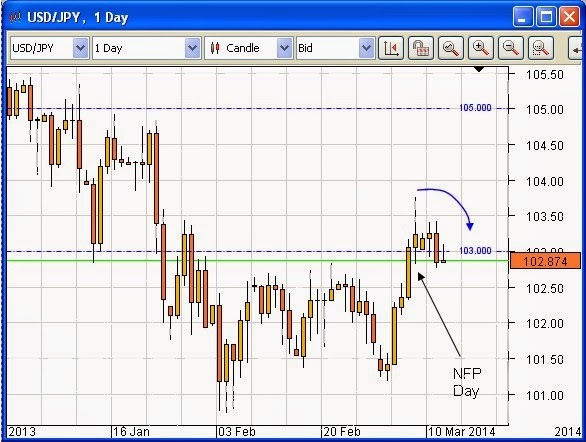 The Nikkei bombed and the Yen strengthened accordingly, pushing down the USDJPY pair. Our Mandelbrot routine will not stand for such behaviour, so it pulled out of the trade for a small loss, which amounted to 0.68% of equity. Fortunately, our other positions moved well into profit, AUDNZD achieving its first target of 2% of equity, where half the position is locked in as profit, and AUDUSD moving nicely to +1.19% of equity. These pairs are showing every sign of continuing in this vein. Gold is still in thrall to developments in Ukraine / Crimea, and so is elevated. We were kept out of a position yesterday, because we believe that the only place to be in gold in the medium to long term is on the short side, in other words to be sellers of the precious metal. So we wait. There is a similar case to be made for Cable, the GBPUSD pair. This attempted to go below the monthly 200 period Simple Moving Average (SMA) yesterday, but was pulled back to exactly that level overnight. Again, we wait, on this occasion until there is indication of a move in one or other direction.